Great card Sylvie.......love the red and white. Sounds like you ad a great time Hun. The perfect Christmas card, Sylvie. I love red on white. ooh very nice !!! Sounds like you have had great fun ! Hi Sylvie, love your card, superb KIS card. Lucky you going back to warm weather, forgotten already what that feels like. Sounds like you had a great time though. Hi Sylvie this is gorgeous I do love the clean and simple style, the stars and twine look ACE. Hello gorgeous!!! so glad you got back safely from UK and so happy Claire's salon launch went well. I was thinking about you. Got any pic's???. So pleased everything is now sorted for your daughter and the shop is open. That must be such a lovely and exciting feeling. I hope her shop is super successful. Your Christmas card is lovely. Just a little reminder from you that it is only half a year away!! Eeeekk!!! Hey Sylvie - let me add my congratulations to Claire as well. We just got in from taking our youngest grandchildren to the beach for a week and now I am trying to catch up! 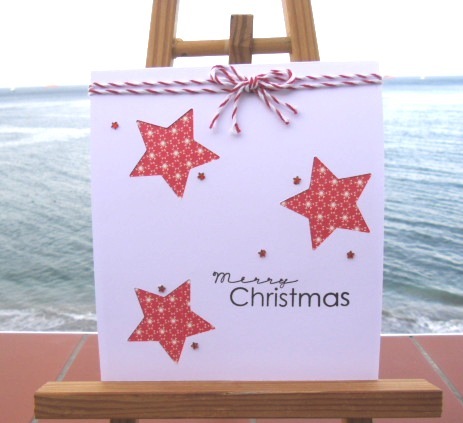 You clean and simple Christmas card is wonderful! Wonderful design work and I love red and white. Just goes to show that clean and simple can be stunning, and this sure is. Fabulous CAS Christmas card Sylvie! Love those stars! Gorgeous Christmas card Sylvie what a fabulous design , I have only just made my first Christmas card , only 49 more to go.....or so ! !